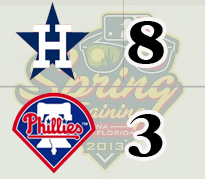 Cole Hamels tossed two impressive innings but the Houston Astros walloped Philadelphia's relief pitchers en route to an 8-3 victory Saturday in Clearwater in the Grapefruit League opener for both clubs. "Physically, I feel really strong," Hamels said. "It's just getting the timing and reps for the muscle memory. Mentally, it's just being prepared every five days now. Starting to get into that routine because it's nice to dial in the routine throughout the season." The Astros took a 3-2 lead in the fourth and the bullpen tossed seven scoreless innings, allowing just four hits. On the Mound: B.J. Rosenberg gave up three runs (two earned) on five hits and a walk over two innings ... Justin De Fratus also allowed a pair of runs over two innings while walking a pair ... Zach Miner surrendered three hits and a pair of runs (one earned) in an inning of work. In the Field: The Phillies committed four errors ... Darin Ruf and Ben Revere each committed fielding errors while Erik Kratz made a throwing error. Up Next: The Phillies travel to Lakeland on Sunday to face Detroit ... Roy Halladay will make his Grapefruit League debut against Justin Verlander.